All that we enjoy today within modern art came from the developments of Renaissance art within Italy and Flemish regions during the 15th and 16th centuries. Their achievements would then spread across the rest of the continent, where others would develop the principles and ideas yet further. Ghiberti's role was within sculpture, which at that time drew in more donors than in later centuries. As Papal states sought to make their republics more impressive than any others, architects, sculptors and painters would all be in high demand. Whilst Ghiberti was a highly significant contributor to the influential renaissance movement, few would put his oeuvre at quite the same level as that of Michelangelo sculptures or Raphael paintings - and who can forget Da Vinci's inventions? The sculptor's output concentrated on quality rather than quantity and perhaps that somewhat limited his exposure in the past few centuries. His bronze doors, for example, took decades to complete, even with the aid of several highly skilled assistants from his respected studio. Whilst his completed project was described by some as Renaissance perfection, it limited his availability on other work. His name, as such, will always be mentioned in the same breath as his Gates of Paradise but in truth there is plenty else to see and enjoy from his impressive career. The individual sculptures of St John the Baptist, St Matthew and St Stephen were all artworks that Ghiberti was able to fit in around his long running projects for the Florence Baptistery. That venue has made use of some of the biggest names in art history including Giotto who designed the Campanile. 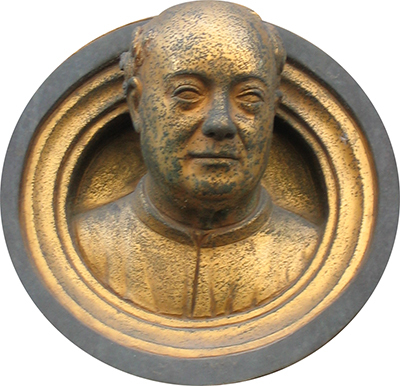 Lorenzo Ghiberti was involved in literature too, writing several books. This confident individual would even outline his own position and role within art history, believing he was passing on ideas and techniques just as those that he had studied had done. Detailed research by art historians has revealed that this artist was as respected during his own lifetime as he is now. It was perhaps the high profile of his major projects that brought about this notoriety while he was still developing his legacy. The republic of Florence was also highly influential across the rest of the Papal States, meaning success here would spread a reputation across borders. Disclaimer: www.lorenzoghiberti.org is a personal website covering the career of famous Italian sculptor Lorenzo Ghiberti, but is in no way an official website for Lorenzo Ghiberti and www.lorenzoghiberti.org does not claim to be that in any way. The Estate of Lorenzo Ghiberti and their presence hold all necessary copyrights and licences for all of his paintings and other works. All prints, paintings and photos included in www.lorenzoghiberti.org are provided as an affiliate to Art.com who hold necessary permissions. Art.com pay us small commissions based on any prints or paintings that you buy as a result of using this website.